1. When a dolphin sleeps, half of its brain stays awake. This allows the dolphin to continue to breathe and prevent drowning while sleeping. 2. The peak mating season for dolphins is during the spring and autumn months. However, they often mate throughout the entire year. The gestation period for dolphins is between 9 and 17 months. The length of time depends on the actual species. 3. The main threat to dolphins is humans because of hunting, fishing, and pollution that we introduce into their ecosystem. 4. There are currently about 36 different species of dolphin existing today. 5. Dolphins use something called “echolocation” to hunt and navigate. This means that they bounce high-pitched sounds off of objects and then listen for the echo. This helps them find what they are looking for. 6. Some dolphins will swim alongside ships in order to save their energy. This is called bow-riding. 7. The only species of dolphin that still has hair when it reaches into adulthood and beyond is the Boto River Dolphin. 8. As mammals, dolphins often need to go to the water’s surface in order to breathe. 9. Dolphins have to make a conscious effort to breathe. 10. As one of the most intelligent mammals, dolphins are able to recognize themselves in a mirror, communicate with other dolphins, mimicry and more. Some biologists consider them to be just beneath humans when it comes to overall intelligence. 11. In ancient Rome, dolphins were trained to help fishermen catch fish. The dolphins would push the fish towards the fishing boat so the fishermen could catch them in their nets. In parts of Brazil, this practice is still used today. 12. The dolphin’s diet is typically made up of cod, plankton, herring, squid and fish. Some species of dolphins eat larger marine prey. Killer whales, for instance, which are members of the dolphin species, will eat sea lions, seals, and other whales. 13. 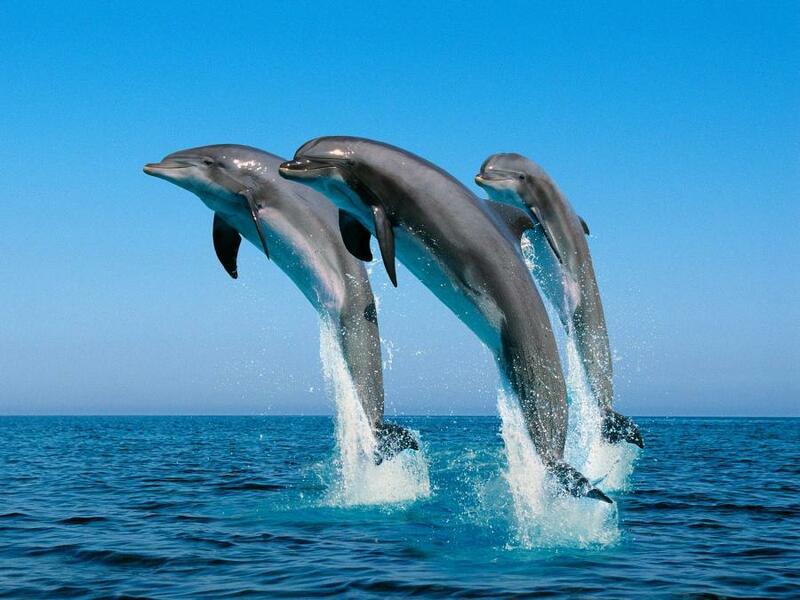 Dolphins are some of the most athletic and agile mammals in the ocean. In fact, some species have been recorded to jump 30 feet out of the water and swim 25 miles per hour. 14. The shortest species of dolphin in terms of length is the Maui dolphin at about 4 feet long. The killer whale species can measure about 30 feet in length and weight as much as 11 tons. 15. Dolphins are very sociable animals. They will travel together in groups, called “pods,” with as many as 30 other dolphins. This number can be even higher for activities like eating. They also travel in large pods so they can help protect each other from larger predators. 16. In order to communicate, dolphins use sounds, such as whistling and clicking. They also use body language, including hitting their fins on the water, bumping into each other, and jumping out of the water. 17. Each individual dolphin has a distinct frequency that allows other dolphins to tell them apart when communicating. The unique frequencies also help mother dolphins keep track of her children when traveling in large pods. 18. Several species of dolphins can live for a long time. The bottlenose dolphin, for instance, can live to be 40 years old. The orca, or killer whale species of dolphin, has been known to often live between 70 and 80 years old in certain conditions. 19. According to the Endangered Species Act, the Chinese River dolphin, the killer whale species, and the Indus River dolphin are all in danger of becoming extinct. 20. Dolphins do not have a sharp sense of smell, but they make up for that with a keen sense of hearing and vision. 21. Sometimes, pods of dolphins will group together. When this happens, there can be hundreds of dolphins in one group. This is called a herd. 22. The dolphin gives birth with the tail coming out first and the head last. This is the only mammal that gives birth like that. 23. Dolphins have two stomachs. The first stomach stores the food for them and the second one digests the food. 24. Some dolphins only need to get oxygen every 30 minutes. However, there are some species that need to get it every 20 seconds. 25. Dolphins have one blowhole on the top of their body that they use to breathe when they reach the surface of the water.